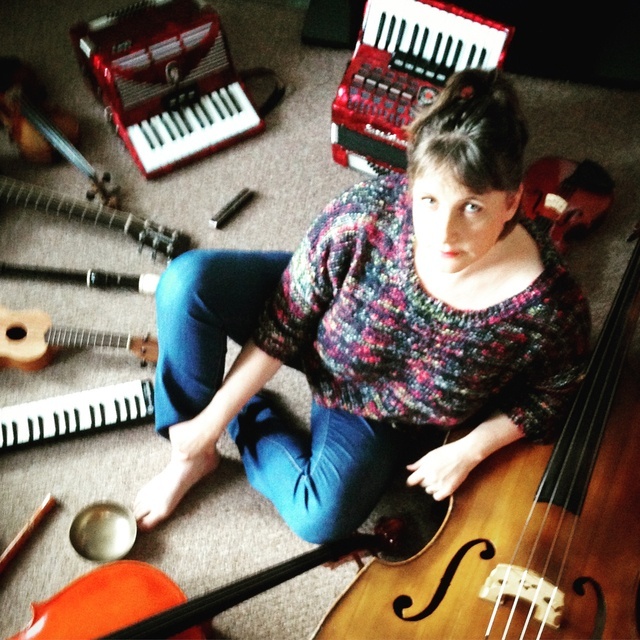 I perform and teach professionally on multiple instruments (my main ones being double bass, violin and piano accordion) in London and Paris as a classical, folk and jazz musician, to many different types of audiences. Feel free to book me for gigs, recordings, private tuition, creative workshops and commissions, and check out my website: www.gemmaboyd for more information. 'Come Down The Blues' by Gemma BoydWritten off the top of my head as I was walking in Claybury Park, Ilford: I was thinking of what instrument to take with me to busk in a freezing Amsterdam next week, and it dawned on me that the most powerful, original and precious instrument I have is my own voice... and at the age of 43 I feel ready to let people hear it. 'Lullaby of the Sea' by Gemma BoydMusic, lyrics and performance by me. 'Chocolate' by Gemma BoydA string quartet. 'Car Horns' by Gemma BoydA composition for my classical guitar student, Joni, who loves cars. 'l'ange' by Gemma BoydI wrote this on a day I felt full of despair. 'Riding the Paris Métro' by Gemma BoydA piece for piano to be played with imagination. 'Crocuses after Snow' by Gemma BoydA piece for piano based on the circle of 4ths. 'Monge Market' by Gemma BoydA piece inspired by Monge Market in Paris. 'Deep Heart' by Gemma BoydA composition I wrote when I was feeling especially passionate. 'Beeswax' by Gemma BoydA piece inspired by watching bees at work on my allotment. 'Mudra of a Thousand Petals' by Gemma BoydThis composition was inspired by my daily yoga and meditation practices. 'The Singing Cave' by Gemma BoydA duet for two violins. 'Blues for Stuart' by Gemma BoydA piece I wrote for my jazz double bass and piano student. 'Twinkle, Twinkle, Little Star' by Ann Taylor (reworked and arranged by Gemma Boyd)A duet for two violins. 'Winter Solstice' by Gemma BoydA piece for cello inspired by the winter solstice 2017. 'Oreo Brownie Trifle (for Raima Singh)' by Gemma BoydFor my piano student, Raima Singh. 'Breath Meditation (based on F sharp Locrian)' by Gemma BoydInspired by the teachings of yoga teacher, Aprille Walker. 'Friends' by Gemma BoydA poem by Gemma Boyd. 'She who' by Gemma BoydA poem by Gemma Boyd. 'I Can't Believe You're In Love With Me' by Semik GemdavFeaturing Sam Chara on vocals, Mike the Mic on guitar and vocals, Gemma Boyd on double bass and Dave Lacey on drums. 'I'm Beginning To See The Light' by Gemma Boyd and Mike the MicGemma Boyd on double bass and Mike the Mic on guitar and vocals. 'I've Found A New Baby' by Gemma Boyd and Mike the MicFeaturing Gemma Boyd on double bass and Mike the Mic on guitar & vocals. 'Katusha' by Gemma Boyd and Mike the MicFeaturing Gemma Boyd on double bass and Mike the Mic on guitar and vocals. 'Jumpin' At The Woodside' by The Priory Street StardustersFeaturing Gemma Boyd on double bass, Piers Clark on guitar, John Pargeter on saxophone and Daniel Rehahn on trombone. 'Aint Misbehavin'' by Gemma Boyd and Mike the MicGemma Boyd on double bass and Mike the Mic on guitar and vocals. 'Double Bass Sonnet' by Gemma BoydA poetic tribute to everything that being a double bassist means to me. 'Out of Antarctica' by Gemma BoydI composed this guitar and piano piece while imagining Antarctica. 'The Dance of the Rain Frogs' by Gemma BoydA composition I wrote inspired in part by the work of Michael Nyman. 'Improvisation' by Gemma BoydThis poem is about the love-hate relationship I had with my double bass at university. 'Gan ainm' by Gemma BoydGemma Boyd playing accordion on this Irish tune. 'An Gliomach' by Gemma BoydGemma Boyd playing violin and accordion on an Irish tune. 'Tà An Coileach Ag Fógairt An Lae' by Gemma BoydGemma Boyd playing piano accordion & violin on this Irish folk tune. 'Inside the Greenhouse' by Gemma BoydA haunting memory from childhood. 'Walking Holiday' by Gemma BoydGemma wrote this following a memorable long weekend walking in Northumberland, England. 'Domestic Lives' by Gemma Boyd'Domestic Lives' references and adapts stage directions from Shakespeare's 'The Taming Of The Shrew,' Michael Frayn's 'Noises Off,' and T. S. Eliot's 'The Cocktail Party' and others of his plays. 'Bapbop' by Gemma BoydThis poem was written following the death of Gemma's grandfather (Bapbop), from lung cancer. 'Celebrity' by Gemma BoydGemma wrote this poem when she was a dresser at the National Theatre, London. 'Ain't Got No' by Samik Gemdav'Ain't Got No' by Brighton & Hove based, Samik Gemdav (featuring Gemma Boyd on double bass, Dave Lacey on percussion, Mike-the-Mic on guitar and vocals and Sam Chara on vocals). 'Easy Living' by The Priory Street StardustersThe Priory Street Stardusters (featuring Gemma Boyd on double bass, Piers Clark on guitar, Daniel Rehahn on trombone, Annie Schutt on vocals and John Pargeter on alto and tenor saxophones and clarinet). The band played swing jazz and blues from the 1930s and '40s. 'Don't Fence Me In' by Samik Gemdav'Don't Fence Me In' by Brighton & Hove based, Samik Gemdav (featuring Gemma Boyd on double bass, Dave Lacey on percussion, Mike-the-Mic on guitar and vocals and Sam Chara on vocals).